In the event of emergency, helps the fire department (some critical infrastructures) to find the nearest working water hydrant. Water department has all the locational data about the water hydrants instead of Fire department. Because of this asymmetric information issue, in any event of emergency, it will cause too much time for Fire Department to figure out the nearest working hydrants. Our product aims to save lots of time for fire department to find out the nearest working water hydrant greatly. They don’t need to call the Water Department to ask for that information and they don’t need to waste time on the water hydrants that is out of service. Every accurate location we generate could actually help one person, one family in any emergent issue. Every second we save does really matter!!! 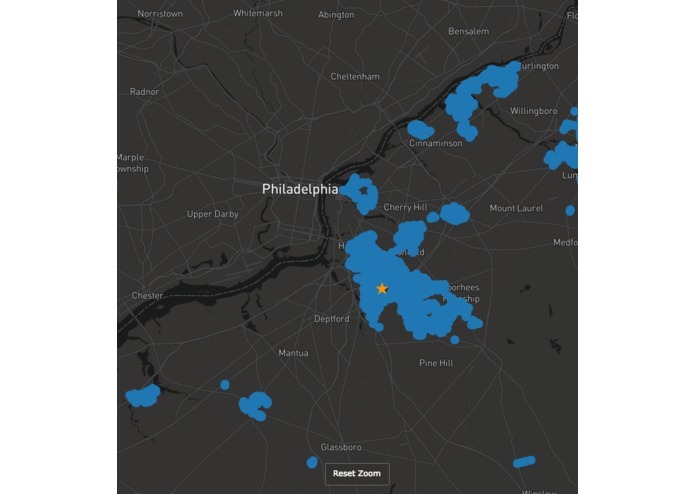 American Water provide the dataset of hydrant information for NJ. The data set contains latitude, longitude, out of service and critical notes. 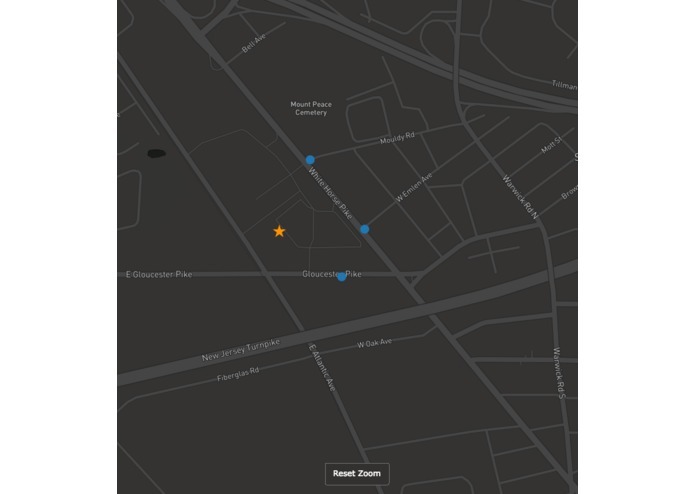 We use scientific way to calculate the distance between two locations and interact with Google Map API to plot the location pin in our web server. Scientific way to figure out the bounding box to reduce the search space. We have two versions of the product! One version realizes the fundamental function. 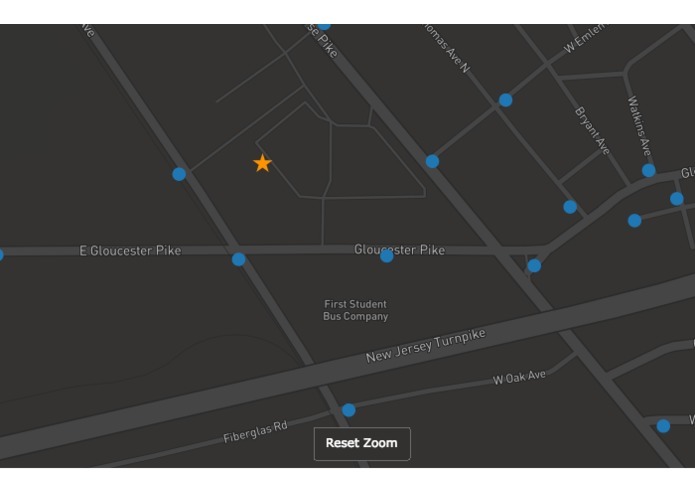 Given an address, it will return the nearest water hydrant location on the map and the description of this water hydrant. You can even zoom the map! To improve the user experience, we developed the second version. We add more functions in our product to allow users to choose by their own preference. 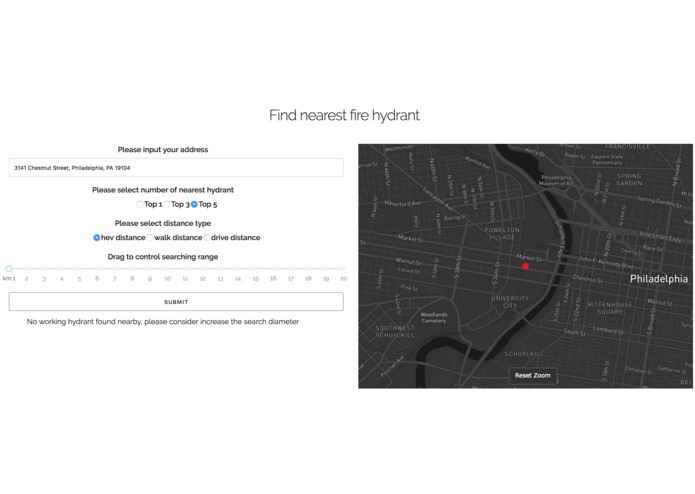 Like to narrow down the search range by different distance window, select how many water hydrant you want it to show. And the most important and innovative function that we are proud of is users can choose what kind of mode you want to use to find the nearest water hydrant. We offer three types of calculation. 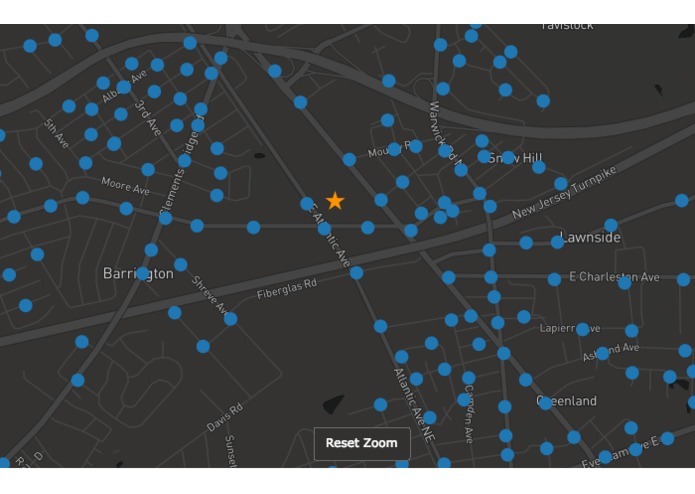 One mode is 'Hive' which is default, it uses the straight-line distance to calculate and find the nearest location. The other two modes are 'Walking' and 'Driving', the product interacts with Google Map and use the human walking distance/ or driving distance to do the calculation. In this way, the product is more user friendly. 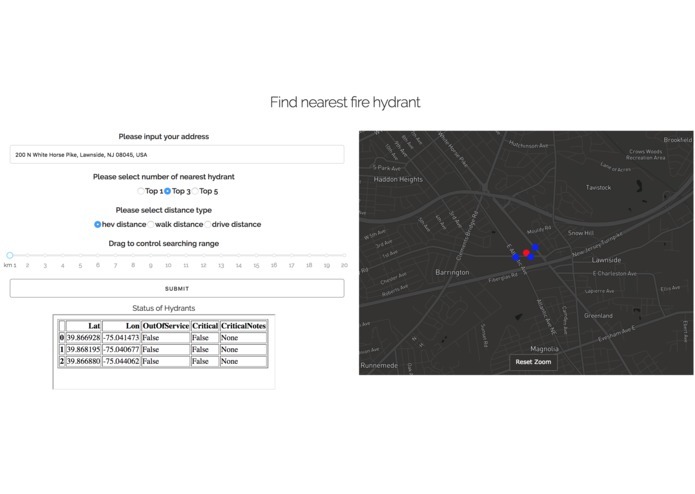 Our product efficiently helps Fire Department to find the nearest working hydrant in NJ area. In the future we can generalize this product into other States and other industry area.